Successfully Added X98 PRO Android TV Box - Amlogic S912 Octa-Core CPU, 3GB RAM, Android 6.0, 4K Video Support, Miracast, Google Play, Kodi TV to your Shopping Cart. Create your own private cinema with the X98 PRO TV Box. This amazing 4K TV box features an Android 6.0 operating system, meaning it comes packed with the latest features the mobile industry has to offer. Perfect for watching movies, playing games and browsing the web – this Android TV box is guaranteed to meet all your entertainment demands. With its smooth yet powerful performance, you’re assured to undergo a great and lag-free user experience. Perfect for entertaining your friends during an upcoming movie night, or for simply enjoying a relaxing evening at home by yourself or with the kids – this 4K TV box guarantees that you’ll never have to feel bored again. Supporting 4K movies, this stunning media player delivers a truly cinematic experience whenever it’s turned on. Grab yourself some popcorn, sit back and relax – with the X98 PRO TV Box, you’ll be able to experience your favorite movies and series like never before. Besides watching the latest movies and series in breathtaking resolution, this Android TV box furthermore allows you to play games and enjoy the latest TV applications from your large screen television. With both Google Play and Kodi TV installed, you’ll have access to an unlimited pool of the latest free to download media – bringing along a years’ worth of entertainment and fun for you and all your loved ones. Packing the Amlogic S912 Octa-Core processor that has been clocked at 2GHz along with a mesmerizing 3GB of RAM, this 4K TV box holds some serious power thanks to which it is capable of handling the latest and most demanding applications, games, and media without dropping a frame. Along with its powerful CPU comes the ARM Mali-T820MP3 GPU, a graphics unit that delivers high-detail and stunning beauty – letting you engage in the most graphically demanding games and experience a truly stunning visual experience. 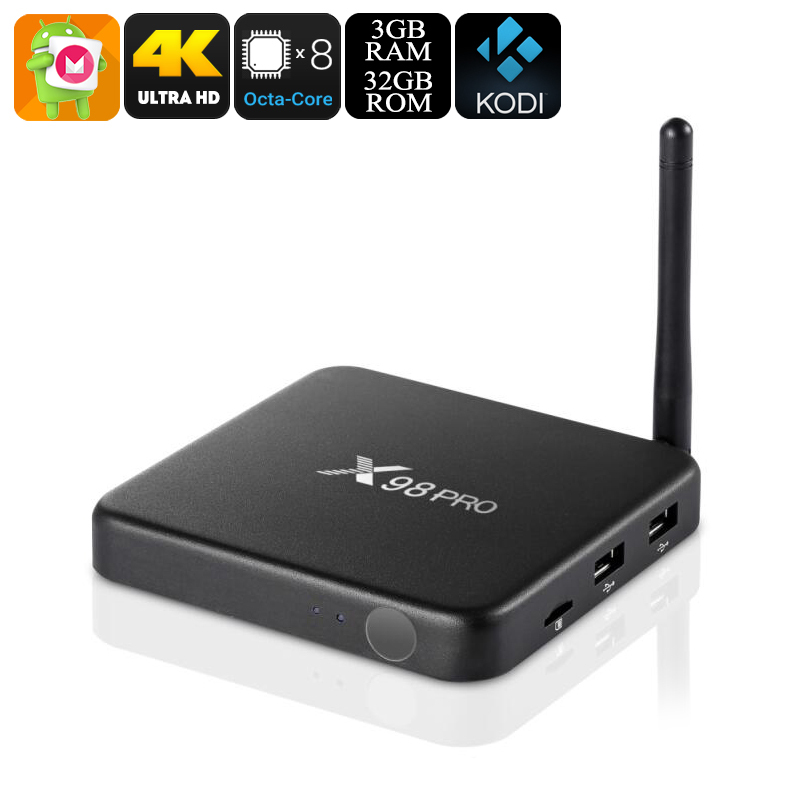 Thanks to its Dual-Band WiFi support, the X98 PRO TV Box allows you to browse the web, stream movies, and download files in the blink of an eye. With its lightning fast internet connectivity, you can be assured you will no longer be interrupted while playing the latest games online or when streaming a movie. A massive 32GB of internal memory and the added possibility to slip in a 64GB of external storage provides you with all the space needed to save all your downloaded files and media – assuring that you’ll never have to worry about running out of space. Being the perfect entertainment device, this 4K TV box is guaranteed to bring countless hours of fun and joy into any modern household and office. The X98 PRO TV Box comes with a 12 months warranty, brought to you by the leader in electronic devices as well as wholesale electronic gadgets..